Today's binding is an Islamic structure known as the full leather chahargoshe, with a hard cover. I showed a soft cover very of this previously. 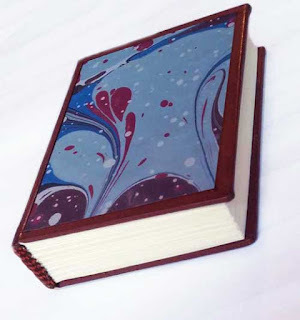 This binding is characterized by the narrow leather edge all around the decorative paper on the cover - probably fabric is more traditional but for this one, I used some of my Ebru for the decorative element.